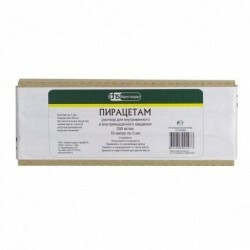 being a precursor of the key ultrastructural components of the cell membrane (mainly phospholipids), it has a wide spectrum of action - helps to restore damaged cell membranes, inhibits the action of phospholipases, prevents excessive formation of free radicals, and also prevents cell death by affecting the mechanisms of apoptosis. In the acute period of a stroke, citicoline reduces the amount of damage to brain tissue, improves cholinergic transmission. In traumatic brain injury, reduces the duration of post-traumatic coma and the severity of neurological symptoms, in addition, reduces the duration of the recovery period. In chronic cerebral hypoxia, citicoline is effective in treating cognitive disorders, such as memory impairment, lack of initiative, difficulties encountered in performing daily activities and self-care. 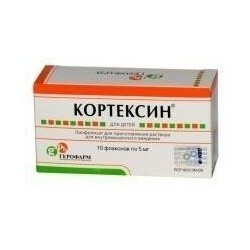 Increases the level of attention and consciousness, and also reduces the manifestation of amnesia. Citicoline is effective in treating sensory and motor neurological disorders of degenerative and vascular etiology. Citicoline is well absorbed when taken orally. Absorption after oral administration is almost complete, and bioavailability is approximately the same as after intravenous administration. Citicoline is largely distributed in brain structures, with the rapid introduction of choline fractions into structural phospholipids and cytidine fractions - into cytidine nucleotides and nucleic acids. Citicoline penetrates the brain and actively integrates into the cellular, cytoplasmic and mitochondrial membranes, forming part of the structural phospholipid fraction. The drug is metabolized in the intestine and in the liver to form choline and cytidine. After taking the concentration of choline in the blood plasma increases significantly. Only 15% of the administered dose of citicoline is excreted from the human body: less than 3% - by the kidneys and through the intestines, and about 12% - with exhaled CO2. In the excretion of citicoline in the urine can be divided into 2 phases: the first phase, which lasts about 36 hours, during which the rate of excretion decreases rapidly, and the second phase, during which the excretion rate decreases much more slowly. The same is observed in exhaled CC2 - the elimination rate decreases rapidly after about 15 hours, and then decreases much more slowly. The acute period of ischemic stroke (as part of complex therapy). The recovery period ischemic and hemorrhagic strokes. Traumatic brain injury (TBI), acute (as part of complex therapy) and the recovery period. Cognitive and behavioral disorders in degenerative and vascular diseases of the brain. excipients: banana flavor (essence “Banana”) 0.4 mg, glycerin 50 mg, potassium sorbate 3 mg, methyl parahydroxybenzoate 1.45 mg, sodium saccharinate 0.2 mg, sodium citrate 6 mg, propyl parahydroxybenzoate 0.25 mg, sorbitol 200 mg, citric acid solution 50% to pH 5.9 - 6.1, purified water to 1 ml. 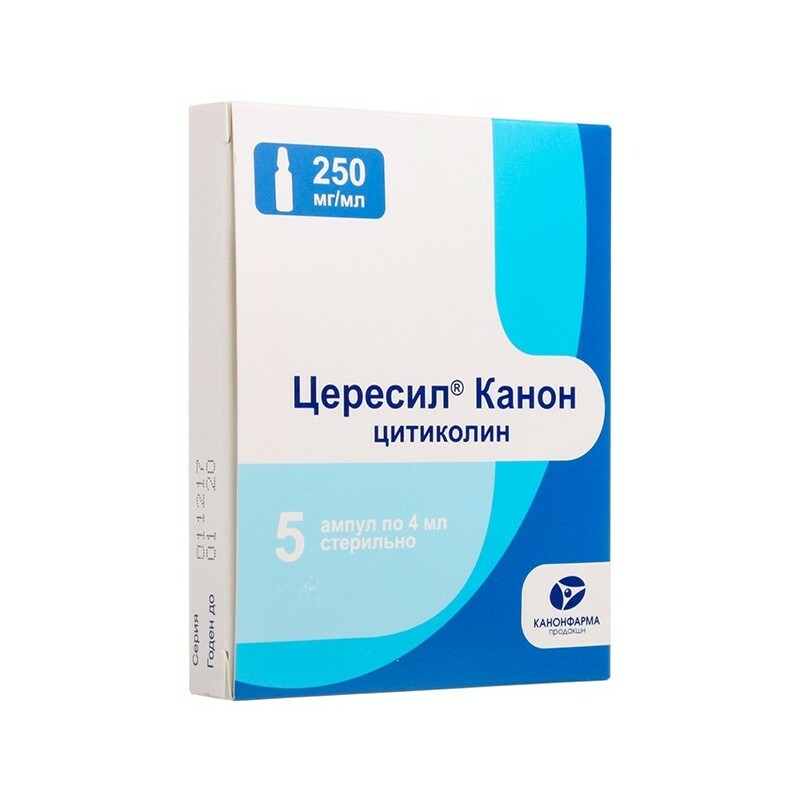 Ceresil® Canon oral solution is administered orally. 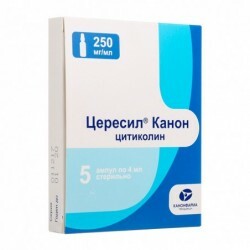 Before use, the drug can be diluted in a small amount of water (100-120 ml or ½ cup). Accepted with meals or between meals. Acute ischemic stroke and traumatic brain injury (TBI): 1000 mg (10 ml) every 12 hours from the first day after diagnosis, treatment duration of at least 6 weeks. 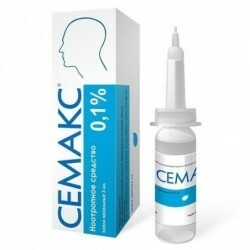 The recovery period of ischemic and hemorrhagic strokes, the recovery period of TBI, cognitive and behavioral disorders in degenerative and vascular diseases of the brain: 500-2000 mg per day (5-10 ml 1-2 times a day). Dosage and duration of treatment depending on the severity of the symptoms of the disease. In some cases, Cerezil® Canon can stimulate the parasympathetic system, as well as provide a short-term change in blood pressure. 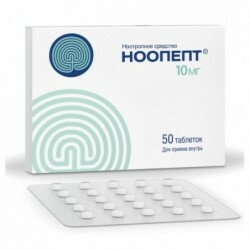 If any of the side effects indicated in the instructions are aggravated, or any other side effects that are not indicated in the instructions have been noticed, you should inform your doctor. Due to the lack of sufficient clinical data, it is not recommended for use in children under 18 years of age. Citicoline enhances the effects of levodopa. 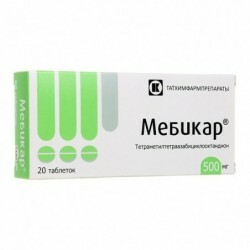 It should not be used simultaneously with drugs containing meklofenoksat. Sufficient data on the use of citicoline in pregnant women are not available. Although no negative effects have been identified in animal studies, during pregnancy the drug Ceresil® Canon is prescribed only in cases where the expected benefit to the mother outweighs the potential risk to the fetus. When prescribing Ceresil® Canon during lactation, women should stop breastfeeding, since there are no data on the allocation of citicoline with breast milk. In the cold, a small amount of crystals may form due to the temporary partial crystallization of the preservative. Upon further storage in recommended conditions, the crystals dissolve within a few months. The presence of crystals does not affect the quality of the drug. During the period of treatment, care should be taken when performing potentially hazardous activities that require special attention and quick reactions (driving and other vehicles, working with moving machinery, the work of the dispatcher and operator, etc.). Given the low toxicity of the drug overdose cases are not described, even in case of exceeding therapeutic doses.